The Miami Beach Boardwalk was installed a few years ago that extends from South Point Park to North Beach and serves as a major artery for foot and bike traffic along this stretch. Including the winding ocean walk in South Beach, the mid-island boardwalk and the North Beach walk its approximately 77 blocks to carry you from beach to beach or to explore as you take a leisurely stroll or exercise in the Florida sunshine. The Central Miami Beach section of the boardwalk stretches from 21st Street to 46th Street and somehow manages to incorporate the city’s signature art deco style. This almost two-mile stretch of boardwalk features several nearby cafes so you can stop and have a refreshment while watching the crowds go by or spend a little time in one of the boutiques along Collins Avenue. There are a number of popular, can’t miss boutiques along the Miami Beach boardwalk on Collins Avenue that will either have exactly what you want and need or will give you that extra luxury you would only buy on vacation. A Dominguez features high-end clothing created by Spanish designer Adolfo Dominguez. His clothing is a little bit different than the norm with interesting cuts, unique fabrics and looks that get noticed. A Dominguez designs for both men and women and features a full selection of accessories to round out your look. Arden B is a charming little boutique with a little bit of everything a gal can wear. From casual clothing to jewelry there’s bound to be something you want or crave. The best part is the prices are pretty reasonable which is nice for any cash-strapped visitors. Art Connection Jewelry features all handmade and one of a kind pieces that will be noticed as unique pieces that catch attention and leave others envious. Their pieces of jewelry come from the owner’s own line as well as many European designers from Switzerland, Spain, England, Germany, France, Italy and the United States. This shop is a little off the heavy shopping district but it’s worth it as they’re frequently awarded for their innovative designs. Club Monaco is one of those stores that defines the upcoming trends and sets the standards for what every fashionista should have in his or her wardrobe. The stock only the hottest designer items and at surprisingly moderate prices. But don’t assume that everything in the store is a throwaway trend, actually, there are a number of staple items that mix and match with the latest trends. In addition to the clothing and accessories, the store also features a list of cosmetics and skin care products that are worth adding to your facial routine. With Miami Beach just steps away a swim shop seems mandatory, so Ritchie Swimwear stepped in to fill that spot. While many of the other stores on Collins Avenue have swimwear this store is dedicated to it and THE place to go for swimwear needs. With all that shopping you might need to grab a quick refreshment or something to eat and relax for a bit and watch the crowds go by, a favorite pastime in Miami. Jerry’s Famous Deli takes old deli favorites and does them they way they were meant to be made originally, full of flavor, incredible ingredients and just enough love that will leave you smiling and delighted in your meal. Preston’s Brasserie in the Lowes Hotel features incredible oceanfront views and food that is described as having a Floribbean flair. It’s a wonderful place to stop for breakfast, lunch or dinner. The Lowes Hotel also features Emeril’s Miami Beach, with a menu created by world famous chef, Emeril Lagasse for a little “BAM” in your day. If the sidewalk cafes on Collins Avenue didn’t appeal to you or you’re looking for something a little less pretentious and much more affordable then check out some of the food and drink concession stands on the beach. They’re definitely not amazing cuisine but they’ll do and are very convenient for beach goers. If you’d like to lie around and enjoy the sun, the sand and the Atlantic Ocean then rent a beach chair and umbrella and hit the beach in style. It’s the ultimate in luxury on Miami Beach, a comfortable chair and a cooling umbrella to keep the sunburn away. And take note that if you’re going to hit the Atlantic Ocean for some swimming or water sports that there are lifeguards and beach patrol on duty. Speaking of water sports, Miami Beach is a great place to try your hand at surfing, kite boarding, windsurfing, paddle boarding, kayaking, snorkeling, jet skiing, parasailing or boating. In fact, there’s probably a few other water activities that you can participate in on Miami Beach that I haven’t mentioned. It’s a great beach for trying out a number of activities and a large number of rental shops along the beach and Miami Boardwalk make it even easier to get your hands on a variety of equipment. If you’re thinking about participating in some sports on Miami Beach but want to stay dry then you can spend some time exploring the walking trails or join a game of volleyball on the beach. 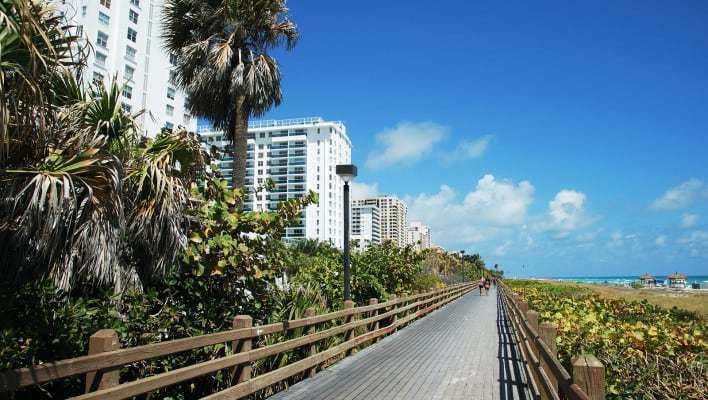 The Miami Beach boardwalk is perfect for walkers, runners, roller bladers, roller skaters, skateboarders, and bikers. If you find you need a little freshening up before you leave the beach, or if you’d like to change into that brand new suit you just bought at one of the Collins Avenue boutiques before you hit the beach there are restroom facilities and showers open to the public on Miami Beach. But perhaps one of the best things to do on the Miami Beach boardwalk is taking a nice leisurely stroll with a loved one after dinner and enjoy the lingering light of the day and the marvels of the stunning Atlantic Ocean.